Whether you’re planning on returning home for the festive season or staying put to enjoy some parent-free party time, it is worth considering now if you are going to need some student self storage. Although students often turn to self storage solutions just before the summer holidays, the winter break can also be a time of change and upheaval. Here are 4 reasons why you might find yourself searching for student self storage services in the lead up to Christmas and the New Year. Even if you rolled up to university with a suitcase and rucksack in September, chances are you will have done a fair bit of shopping since then – and that’s not including Christmas presents! There are many reasons (see below) why you might not want or be able to store your possessions in your current house or flat. 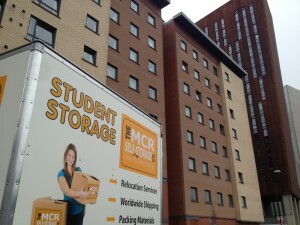 Student self storage is the natural answer. Many students, especially in their second and third years, find that the happy shared house they signed up for in the summer is not what they ended up with. Rather than spend another two terms being miserable, they opt to move in with other friends in the New Year. Unfortunately, neither their old nor new landlord will allow them to store their belongings over the Christmas break. Self-storage is the best solution. Some courses, especially foreign language and other international-themed courses, include a period spent overseas. If you are due to go to the continent or further afield for the Spring Term but don’t want to move all of your things, you could make use of student self storage. Even if you aren’t moving house or you are permitted to move your belongings in early (or out late), have you thought about security? With no peers to look out for your worldly goods and every criminal in the city knowing that students are going home to their families, there is a reasonable chance that opportunists might come sniffing for some early Christmas gifts. Most student self storage solutions will include CCTV cameras, 24/7 alarm systems and plenty of perimeter fencing – unlike student housing. It’s strange to think that in a world which is ever more mobile and geared to convenience, many student self storage companies expect their customers to drive their possessions to the storage unit with no help. Most students are inexperienced drivers, especially when it comes to large vehicles like vans. Many won’t have even passed their driving tests. Fortunately, companies like the Manchester Self Storage Company offer mobile self storage. With our service, all you have to do is order one or more Mobile Self-Storage Unit and pick a convenient time for us to drop it at your house or halls (if you can order a Domino’s, you can manage that!). We will also provide some boxes and a Student Packing Kit. You then need to bribe some friends to help you load the unit, lock it securely (that bit is important!) before kicking back and watching some Netflix. We will pick up the unit and take your items to our clean, dry and secure storage facility until you need them delivered back to you (when and wherever that might be). Rather than wait until the last minute (your assignment can wait) we recommend you secure your booking by giving our friendly team a quick call today. We also offer a student discount, so please ask about that too.